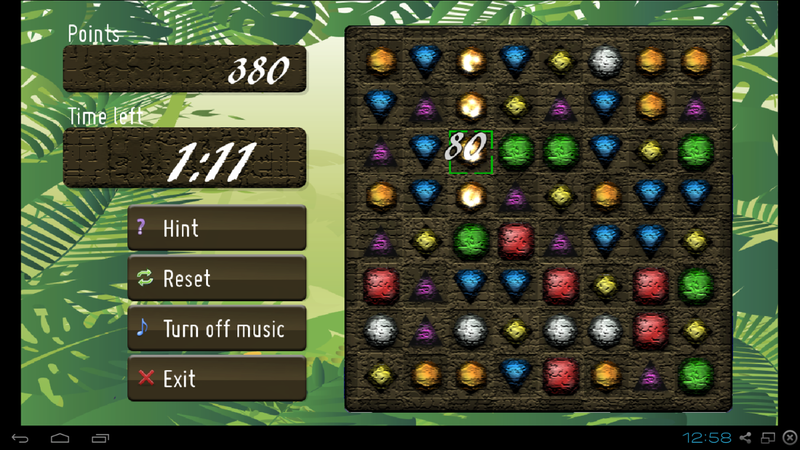 Jungle Jewels puts a new spin on the classic match-3 game. Players to explore an ancient pyramid to discover dozens of crystals, diamonds, rubies, and other rocks. Each jewel holds a magical power. Your task is to collect and match as many as you can before the pyramid collapses. Players earn points and prolong the game by matching three crystals in a row. It reminds me of Tetris, one of my all-time favorites. Like Tetris, it's simple, fun, fast and addictive. It makes you think and act quickly, but it's not overwhelming. Check out Jungle Jewels and other free games for Android by Silver Pick Studios in the Google Play store.